What Day Of The Week Is December 29? 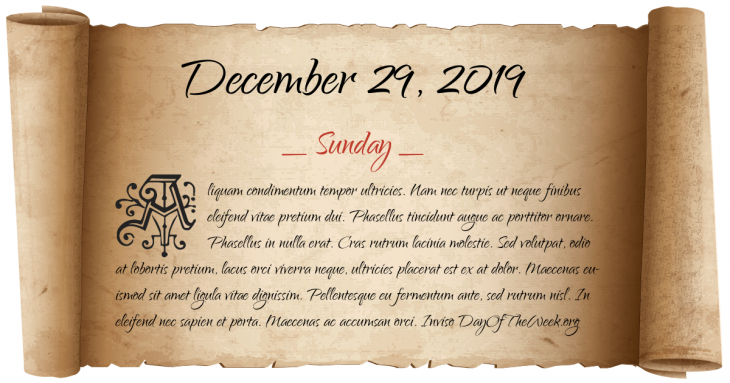 December 29, 2019 is the 363rd day of the year 2019 in the Gregorian calendar. There are 2 days remaining until the end of the year. The day of the week is Sunday. The USS Constitution under the command of Captain William Bainbridge, captures the HMS Java off the coast of Brazil after a three hour battle. The Ashtabula River Railroad bridge disaster occurs, leaving 64 injured and 92 dead at Ashtabula, Ohio. A Portrait of the Artist as a Young Man, the first novel by James Joyce, is serialised in The Egoist. Physicist Richard Feynman gives a speech entitled “There’s Plenty of Room at the Bottom”, which is regarded as the birth of nanotechnology. A bomb explodes at LaGuardia Airport in New York, New York, killing 11 people and injuring 74. Guatemala and leaders of Guatemalan National Revolutionary Union sign a peace accord ending a 36-year civil war. Who were born on December 29?